Peripheral primitive neuroectodermal tumors (pPNETS) are the focus of this review. See the image below. 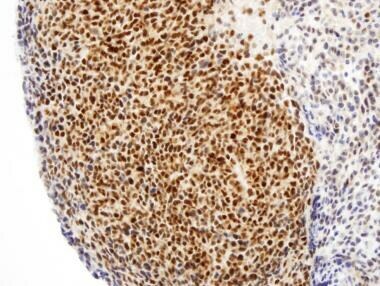 Photomicrograph shows characteristic cytoplasmic CD-99 staining in peripheral primitive neuroectodermal tumor. Peripheral primitive neuroectodermal tumors (pPNETs) are also classified as part of the Ewing family of tumors (EFTs); peripheral primitive neuroectodermal tumors (pPNETs) and Ewing family of tumors (EFTs) are often referred to interchangeably in the literature. Generally, Ewing family of tumors (EFTs) and peripheral primitive neuroectodermal tumors (pPNETs) represent different manifestations of the same tumor and have similar genetic alterations. Ewing sarcoma, however, is more common in bone, while peripheral primitive neuroectodermal tumors (pPNETs) are more common in soft tissues. Immunohistochemical and cytogenetic studies suggest that these tumors all have a common origin. Stout first described PNETs in 1918, and these tumors were thought to arise directly from nerves. The pathologic and cytogenetic understanding of these tumors has significantly advanced over the last 25 years. Based on molecular cytogenetic analysis, both EFTs and peripheral primitive neuroectodermal tumors (pPNETs) are known to share the same reciprocal translocations, most commonly between chromosomes 11 and 22. Further advances in immunohistochemical analyses have helped further distinguish PNETs and Ewing family of tumors (EFTs) from other small, round, poorly differentiated tumors, including rhabdomyosarcoma, neuroblastoma, and lymphoma. Peripheral primitive neuroectodermal tumors (pPNETs) often exhibit aggressive clinical behavior, with worse outcomes than other small, round cell tumors. The incidence of peripheral primitive neuroectodermal tumors (pPNETs) is likely underreported in the literature because recent diagnostic advances have allowed these tumors to be distinguished from other small, poorly differentiated, round cell tumors. Although peripheral primitive neuroectodermal tumors (pPNETs) are exceedingly rare, the annual incidence of tumors from the larger Ewing family of tumors (EFTs) from birth to age 20 years is 2.9 per million population. In most large series published to date, peripheral primitive neuroectodermal tumors (pPNETs) usually present in the second decade of life, with a slight male preponderance. They account for 4-17% of all pediatric soft tissue tumors. Of note, these tumors are rare in African American children and children of Asian descent, with most worldwide cases occurring in white and Hispanic children and adolescents. Most peripheral primitive neuroectodermal tumors (pPNETs) manifest in the thoracopulmonary region (Askin tumor), pelvis, abdomen, and extremities. In a large series of 26 cases, Jones and McGill reported 11 of 26 patients with disease in the head and neck. Most other large published series, however, reveal a paucity of cases in the head and neck region. [11, 12, 13] Of the published cases involving the head and neck, the sites of presentation are diverse and include the paranasal sinuses, jugular foramen, oral cavity, nasal cavity, neck, skull, lingual nerve, parotid gland, larynx, retropharyngeal space, maxilla, mandible, masseter, temporal area, pterygomaxillary space, esophagus, and orbit. Clinical symptoms depend on the site of presentation but invariably include pain and swelling of the surrounding structures due to mass effect. Other reported symptoms and signs are site specific, including individual cranial neuropathies, exophthalmos, epistaxis, nasal obstruction, anosmia, neck masses, and headache (see the image below). The significant prognostic factors of peripheral primitive neuroectodermal tumors (pPNETs) include site, tumor volume, and the presence of metastasis. Kimber et al, in a review of 26 patients with pPNET who were treated with chemotherapy, reported that patients with head and neck pPNET had an intermediate prognosis when compared with patients with paraspinal and scapular disease (who fared better) and those with abdominopelvic disease (who fared much worse). Because peripheral primitive neuroectodermal tumors (pPNETs) are highly aggressive, patients may have metastatic disease at presentation. With reverse transcription polymerase chain reaction (RT-PCR) technology, several groups have demonstrated micrometastatic disease in the bone marrow of up to 30% of patients thought to have a localized disease. The most common sites of pPNET metastases include the lung, bone, and bone marrow. In several large series, the rates of metastases range from 20-31%, with abysmal long-term survival rates (< 25%). Again, with the diagnostic advances made in recent years, more accurate information regarding disease-free and long-term survival will be available in the future. The information obtained with light microscopy, cytogenetic analysis, and the immunohistochemical profile of tumor cells is essential in diagnosing peripheral primitive neuroectodermal tumors (pPNETs). On light microscopy, peripheral primitive neuroectodermal tumors (pPNETs) appear as a monotonous collection of small, round, darkly stained cells. However, peripheral primitive neuroectodermal tumors (pPNETs) cannot be distinguished from other tumors with small round cells based on histologic studies alone. Other tumors with a similar appearance on light microscopy include rhabdomyosarcoma, neuroblastoma, and non-Hodgkin lymphoma. In these tumors, Homer-Wright rosettes, in which the tumor cells are arranged about a central space filled with fibrillar extension of the cells, can be found. Examination of peripheral primitive neuroectodermal tumors (pPNETs) with electron microscopy reveals neurosecretory granules with microtubules and microfilaments. In addition, short dendritic processes lie between cells in peripheral primitive neuroectodermal tumors (pPNETs), in contrast to Ewing sarcoma, in which the dendritic processes are absent. The elucidation of the immunohistochemical profile allows the pathologist to distinguish peripheral primitive neuroectodermal tumors (pPNETs) and EFTs from other small, round cell tumors. Immunohistochemistry can be used to detect antibodies to FLI-1 in the gene fusion product of EWS. The expression of the MIC2 gene produces an antigen, MIC2, which consistently identifies both Ewing sarcoma and peripheral primitive neuroectodermal tumors (pPNETs). In contrast, CNS PNETs and neuroblastomas uniformly lack the expression of the MIC2. Furthermore, peripheral primitive neuroectodermal tumors (pPNETs) typically coexpress CD99 (the glycoprotein MIC2) and vimentin. Other nonspecific markers include S-100, neuron-specific enolase, CD75, and synaptophysin. Tissue biopsy with cytogenetic and immunohistochemical studies is paramount in diagnosing peripheral primitive neuroectodermal tumors (pPNETs). Radiologic studies such as computed tomography (CT) scanning and magnetic resonance imaging (MRI) are essential in determining the limits of tumor involvement and ruling out metastatic disease. Photomicrograph shows characteristic nuclear FLI-1 staining in peripheral primitive neuroectodermal tumor. 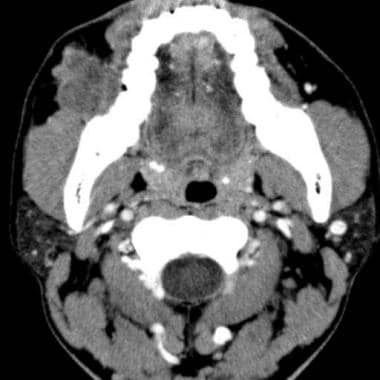 Axial CT scan depicting peripheral primitive neuroectodermal tumor. Immunohistochemical staining ultimately confirmed diagnosis of a peripheral primitive neuroectodermal tumor. 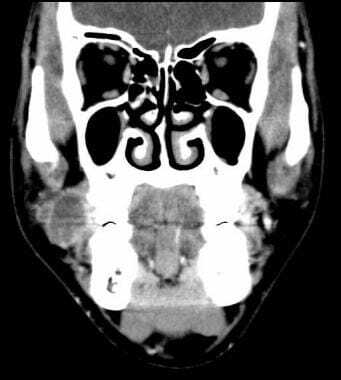 Coronal CT scan showing a 2x3 cm partially septated mass, predominately hypodense to skeletal muscle, nestled between the lateral aspect of the right buccinator muscle, the anterior aspect of the right masseter muscle, and the medial aspect of the right buccal fat pad. Because of the high incidence of metastatic disease at presentation, a full metastatic workup is indicated in a suspected case of pPNET, including chest radiography, CT scanning of the chest, and a bone marrow biopsy. Furthermore, because pPNET is diagnosed based on biopsy findings, more extensive investigations, such as a technetium 99m bone scan or positron emission tomography (PET) scan, may be indicated. Other adjunctive studies include testing for urinary catecholamines and their metabolites, which are positive in patients with neuroblastoma but negative in patients with PNET and Ewing family of tumors (EFTs). Obtaining a complete resection of disease with negative margins is paramount in surgically treating primitive neuroectodermal tumors (PNETs) in the head and neck. In some cases, however, the aggressive nature and diffuse spread of these tumors precludes complete surgical excision. Furthermore, complete surgical resection may not be possible when vital structures are involved. Chemotherapy and radiation are necessary adjuncts in the treatment of primitive neuroectodermal tumors (PNETs). Chemotherapy regimens have significantly improved outcomes in patients with peripheral primitive neuroectodermal tumors (pPNETs). The treatment paradigms differ based on whether the disease is localized or metastatic. As would be expected, the treatments for peripheral primitive neuroectodermal tumors (pPNETs) and Ewing family of tumors (EFTs) are similar in terms of chemotherapeutic regimens. The treatment of metastatic disease similarly includes neoadjuvant and adjuvant chemotherapy, as well as radiotherapy to all sites of gross disease with surgical excision, where possible. As there is a paucity of head and neck peripheral primitive neuroectodermal tumors (pPNETs) reported in the literature, clinical trials for treatment regimens specific to the head and neck is limited. Current treatment strategies and response rates often include tumors from other subsites. Recommendations for fractionated treatment schedules with higher treatment doses are typically reserved for patients with gross residual disease and microscopic disease. Peripheral primitive neuroectodermal tumors (pPNETs) are a group of aggressive malignancies that most commonly present in the thoracopulmonary region (Askin tumor), abdomen, pelvis, and, rarely, in the head and neck. The most significant prognostic factor is the presence or absence of metastatic disease, with the former group of patients having a dismal long-term prognosis. Significant advances in the neoadjuvant and adjuvant chemotherapeutic regimens, as well as improved facility in diagnosing these tumors through cytogenetic and immunohistochemical analysis, should improve long-term disease-free survival. How are primitive neuroectodermal tumors (PNETs) characterized? How are primitive neuroectodermal tumors (PNETs) classified? What is the prevalence of primitive neuroectodermal tumors (PNETs)? Where do primitive neuroectodermal tumors (PNETs) most commonly manifest? What are the signs and symptoms of primitive neuroectodermal tumors (PNETs)? What is the prognosis of primitive neuroectodermal tumors (PNETs)? Which conditions are included in the differential diagnoses of primitive neuroectodermal tumors (PNETs)? Which pathologic findings are characteristic of primitive neuroectodermal tumors (PNETs)? Which studies are performed in the workup of primitive neuroectodermal tumors (PNETs)? What is the role of imaging studies in the workup of primitive neuroectodermal tumors (PNETs)? Which studies are performed in a full metastatic workup of primitive neuroectodermal tumors (PNETs)? What is the role of surgery in the treatment of primitive neuroectodermal tumors (PNETs)? How are primitive neuroectodermal tumors (PNETs) treated? What are primitive neuroectodermal tumors (PNETs)? Batsakis JG, Mackay B, el-Naggar AK. Ewing's sarcoma and peripheral primitive neuroectodermal tumor: an interim report. Ann Otol Rhinol Laryngol. 1996 Oct. 105(10):838-43. [Medline]. Sturm D, Orr BA, Toprak UH, et al. New Brain Tumor Entities Emerge from Molecular Classification of CNS-PNETs. Cell. 2016 Feb 25. 164 (5):1060-72. [Medline]. Campbell K, Shulman D, Janeway KA, DuBois SG. Comparison of Epidemiology, Clinical Features, and Outcomes of Patients with Reported Ewing Sarcoma and PNET over 40 Years Justifies Current WHO Classification and Treatment Approaches. Sarcoma. 2018. 2018:1712964. [Medline]. [Full Text]. Castro EC, Parwani AV. Ewing sarcoma/primitive neuroectodermal tumor of the kidney: two unusual presentations of a rare tumor. Case Report Med. 2012. 2012:190581. [Medline]. [Full Text]. PDQ Pediatric Treatment Editorial Board. Ewing Sarcoma Treatment (PDQ®): Health Professional Version. 2019 Jan 31. [Medline]. [Full Text]. Triarico S, Attina G, Maurizi P, et al. Multimodal treatment of pediatric patients with Askin's tumors: our experience. World J Surg Oncol. 2018 Jul 13. 16 (1):140. [Medline]. Li D, Hao SY, Wang L, et al. Clinicoradiological features and surgical outcomes of primary intracranial medulloepitheliomas: a single-center experience and pooled analysis of individual patient data. J Neurosurg. 2018 Jul 6. 1-15. [Medline]. Stout AP. A tumor of the ulnar nerve. Proc NY Pathol Soc. 1918. 18:2-11. Windfuhr JP. Primitive neuroectodermal tumor of the head and neck: incidence, diagnosis, and management. Ann Otol Rhinol Laryngol. 2004 Jul. 113(7):533-43. [Medline]. Jones JE, McGill T. Peripheral primitive neuroectodermal tumors of the head and neck. Arch Otolaryngol Head Neck Surg. 1995 Dec. 121(12):1392-5. [Medline]. Jürgens H, Bier V, Harms D, et al. Malignant peripheral neuroectodermal tumors. A retrospective analysis of 42 patients. Cancer. 1988 Jan 15. 61(2):349-57. [Medline]. Kushner BH, Hajdu SI, Gulati SC, Erlandson RA, Exelby PR, Lieberman PH. Extracranial primitive neuroectodermal tumors. The Memorial Sloan-Kettering Cancer Center experience. Cancer. 1991 Apr 1. 67(7):1825-9. [Medline]. Marina NM, Etcubanas E, Parham DM, Bowman LC, Green A. Peripheral primitive neuroectodermal tumor (peripheral neuroepithelioma) in children. A review of the St. Jude experience and controversies in diagnosis and management. Cancer. 1989 Nov 1. 64(9):1952-60. [Medline]. Kimber C, Michalski A, Spitz L, Pierro A. Primitive neuroectodermal tumours: anatomic location, extent of surgery, and outcome. J Pediatr Surg. 1998 Jan. 33(1):39-41. [Medline]. Jiang S, Wang G, Chen J, Dong Y. Comparison of clinical features and outcomes in patients with extraskeletal vs skeletal Ewing sarcoma: an SEER database analysis of 3,178 cases. Cancer Manag Res. 2018. 10:6227-36. [Medline]. [Full Text]. Turc-Carel C, Aurias A, Mugneret F, et al. Chromosomes in Ewing's sarcoma. I. An evaluation of 85 cases of remarkable consistency of t(11;22)(q24;q12). Cancer Genet Cytogenet. 1988 Jun. 32(2):229-38. [Medline]. Zucman J, Melot T, Desmaze C, et al. Combinatorial generation of variable fusion proteins in the Ewing family of tumours. EMBO J. 1993 Dec. 12(12):4481-7. [Medline]. Liu BY, Yang Y, DU J, Zhang Y, Wang H, Zheng J. [Application of the in situ hybridization with EWS dual-color break-apart fluorescence probe and anti-CD99 and anti-FLI-1 antibodies in the diagnosis of Ewing's sarcoma/primitive neuroectodermal tumor]. Beijing Da Xue Xue Bao. 2008 Aug 18. 40(4):358-62. [Medline]. Ishii N, Hiraga H, Sawamura Y, Shinohe Y, Nagashima K. Alternative EWS-FLI1 fusion gene and MIC2 expression in peripheral and central primitive neuroectodermal tumors. Neuropathology. 2001 Mar. 21(1):40-4. [Medline]. Armbruster C, Huber M, Prosch H, Dworan N, Attems J. Ewing's sarcoma and peripheral primitive neuroectodermal tumor in adults: different features of a rare neoplasm. Onkologie. 2008 Apr. 31(4):179-84. [Medline]. Ba L, Tan H, Xiao H, et al. Radiologic and clinicopathologic findings of peripheral primitive neuroectodermal tumors. Acta Radiol. 2014 Jul 29. [Medline]. Xiao H, Bao F, Tan H, Wang B, Liu W, Gao J, et al. CT and clinical findings of peripheral primitive neuroectodermal tumour in children. Br J Radiol. 2016 Feb 23. 20140450. [Medline]. Zhang WD, Xie CM, Mo YX, Li JY. [CT and MRI features of peripheral primitive neuroectodermal tumor]. Ai Zheng. 2007 Jun. 26(6):643-6. [Medline]. Carvajal R, Meyers P. Ewing's sarcoma and primitive neuroectodermal family of tumors. Hematol Oncol Clin North Am. 2005 Jun. 19(3):501-25, vi-vii. [Medline]. Inskip PD, Curtis RE. New malignancies following childhood cancer in the United States, 1973-2002. Int J Cancer. 2007 Nov 15. 121(10):2233-40. [Medline]. Kuttesch JF Jr, Wexler LH, Marcus RB, et al. Second malignancies after Ewing's sarcoma: radiation dose-dependency of secondary sarcomas. J Clin Oncol. 1996 Oct. 14(10):2818-25. [Medline]. Scurr M, Judson I. How to treat the Ewing's family of sarcomas in adult patients. Oncologist. 2006 Jan. 11(1):65-72. [Medline]. Jin SY, Choi JY, Park KD, et al. Thyroid dysfunction in patients with childhood-onset medulloblastoma or primitive neuroectodermal tumor. Ann Pediatr Endocrinol Metab. 2018 Jun. 23 (2):88-93. [Medline]. [Full Text]. de Blank PM, Ostrom QT, Rouse C, et al. Years of life lived with disease and years of potential life lost in children who die of cancer in the United States, 2009. Cancer Med. 2015 Apr. 4 (4):608-19. [Medline]. [Full Text].